Do the Twins have a new team physician? | That's Twins Baseball. A Minnesota Twins Blog. 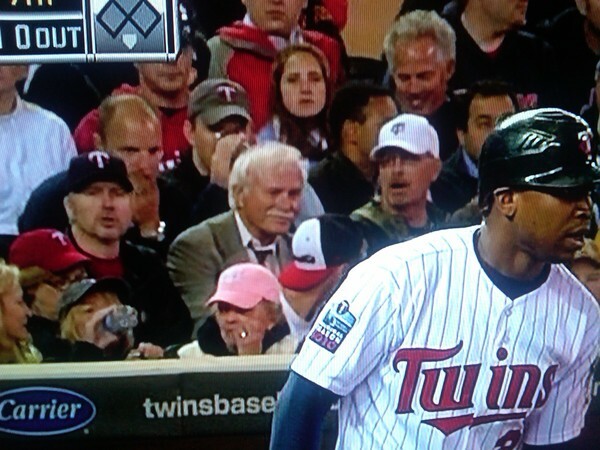 Do the Twins have a new team physician? TARGET FIELD — Twins fans received great news today after an MRI on catcher Joe Mauer’s heel revealed only a soft tissue bruise instead of a deep bone bruise. While the news is a sigh of relief for fans, there are still a few questions to be answered. A few days ago manager Ron Gardenhire said Mauer would be week-to-week with the heel problem and then suddenly today he’s feeling much better and is day-to-day. So what has changed the last few days? We know it’s not sports medicine but perhaps the person practicing sports medicine. Our senior photographer guy snapped this photo during the May 4th Twins game. The man in the photo resembles somebody well known in baseball circles, Iowa cornfields, and Chisholm, MN. The person in the photo appears to be none other than Moonlight Graham. He better get home before Alicia thinks he has a girlfriend. This would certainly indicate the sudden change in Mauer’s heel status as a pro like Moonlight would have noticed a misdiagnosis. It would also explain how Jose Mijares dislodged that hot dog he was choking on after he fell off Gardy’s good side.